How to Check if a list Item is using Unique permissions or inheriting permissions from the parent? Navigate to the list/library and then select the list item. From the details pane, Click on "Manage Access" link (in Classic experience, Click on "Advanced" >> "Shared With") and then click on "Advanced" link. 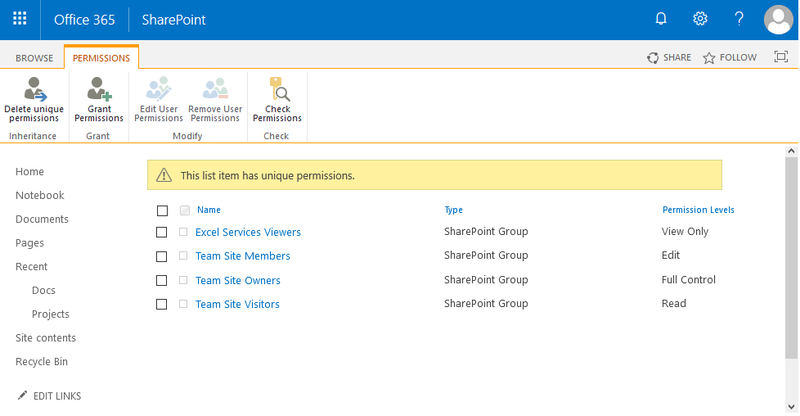 This takes you to the Advanced permissions page of the list item, which gives you the information whether the list item has unique permissions or its inheriting permissions from the parent. E.g. You'll get the text "This list item has unique permissions"
Lets get all list items with unique permissions using PowerShell. Write-Host -f Green "List Item '$($ListItem["Title"])' with ID '$($ListItem.ID)' has Unique Permissions"
Write-Host -f Yellow "List Item '$($ListItem["Title"])' with ID '$($ListItem.ID)' is inhering Permissions from the Parent"